I’m not saying the Camaro is a bad car, in fact I think it’s a great car. It’s just that from a value for dollar viewpoint, the Jaguar has it beat. If the Camaro were more reasonably valued it would be a no brainer. It’s strange how something technically mundane can become more than the sum of its parts while something better engineered ends up being nearly worthless. Both cars carry a long racing heritage in their DNA, one being built up from pedestrian origins, the other distilled down from racing experience. I like to keep things in period as much as possible. While everybody else is using electric cooling fans, overdrive gearboxes, and fuel injection, I choose to use what someone might use in the seventies: a carburetor, a mechanical cooling fan, and a 1.1 top ratio transmission. Further, I am using a manual gearbox, a 4-speed. There are hidden advantages to going the 4-speed route over the latest and greatest modern 6 speeds, and I will delve into that in another piece. As school draws to a close for the Summer I have redirected my attention towards Jagusa and am making progress on several fronts. I have been tackling electrical issues consistent with mid-seventies British Leyland products: fuzzy switches, dodgy grounds, bad connections, etc. I have sourced a complete black interior from a parts car I happened upon last fall. Slowly as I deem certain sections of electrical suitable for use, I button it up with a panel and the seats migrate into place. After a year of sitting, the engine fired up on stale gas with little provocation other than a spurt or two of ether. The past year saw me amass a pile of special parts for the car, including a period Nardi steering wheel, a set of now discontinued 80 series Koni shocks, the Recaro seats I have had in the rafters waiting for “that special car,” a set of late XJS 16 inch alloy rims (unpolished) to allow the fitment of decent speed rated rubber, and everything to install European market bumpers. I still have yet to get everything needed for the V8 swap since I intend to re-engineer the conversion somewhat owing to my use of a manual gearbox as well as the desire to correct some flaws with the conversion itself. It is somewhat of a secret that outside of the US, Jaguar is viewed as a sporting make. 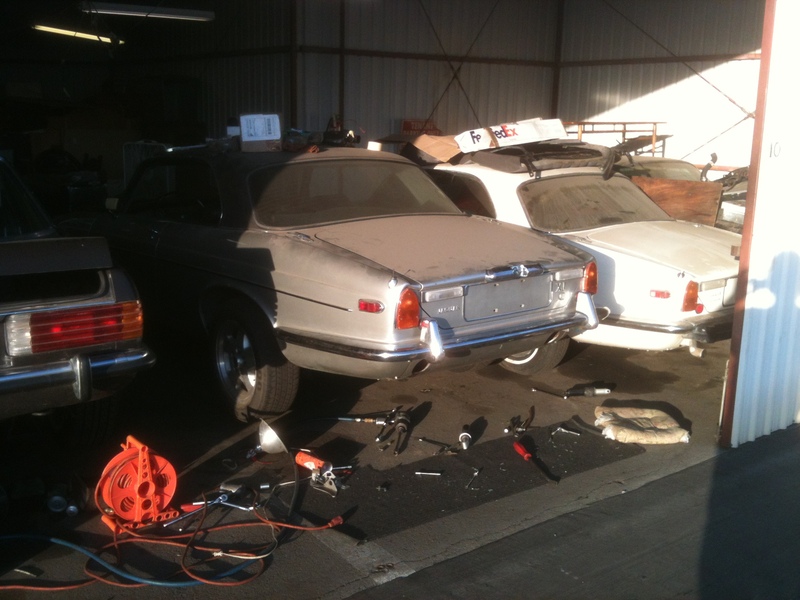 Everywhere else, the XJ6 and XJS could be had with a variety of options geared towards performance. Sport suspensions, body kits, even manual gearbox options were available to you if you were a buyer purchasing a new Jaguar somewhere other than in the US. After searching high and low for European bumpers and sorting out how to effect a factory style manual transmission conversion to compliment the V8 for Jagusa, I am still many labor hours and several thousand dollars away from a completed project. Fuel system upgrades, exhaust design, 2.88 Power-Loc rebuild, custom radiator, speedometer and tachometer issues, and heater circuit redesign to work with a Chevy V8 (constant flow for the Chevy vs. interrupted flow for the Jaguar engine) add up to many man hours and lots of money. This is at odds with the fact that my wife Samantha and I have no cool car right now that runs decently enough to take on driving events or use for long journeys, and we want something to drive sooner rather than later, at least for now while Beatrice gets her rebirth. A short circuit to driving pleasure has been found in the form of a certain XJ6 I have tracked for years. I am subjected to constant gentle prodding from my dear friend Malcolm, who found for me the XJ6C that is to become Jagusa. Having always known my eventual intent for the car, he takes great pains to gently convince me to at least try to live with the original drive train for a period of time before condemning (his words) the car to hybrid status. My retort was always the same: Gutless federal specification engine, crappy Borg-Warner Model 65 automatic transmission, short gearing, soft suspension, blah, blah, blah. My challenge to him is that if those issues can be surmounted while keeping the original engine, I will reconsider. 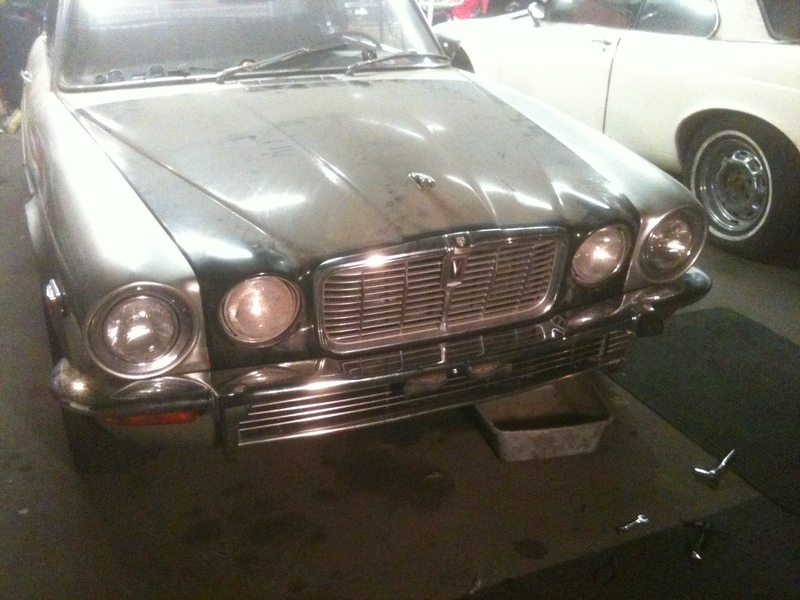 Recently he provided an answer to my challenge in the form of a modified but wrecked series 1 XJ6. I have known about this car for at least 10 years; it belonged to his son, who built the car using a rusty UK market XJ6 donor car. The end result was recently involved in a T-bone that bent the unibody into a banana shape. Seeing this wrecked car leaves no doubt in my mind that Jaguar built a safe vehicle with the XJ6. The big valve headed 4.2 engine he installed is long gone, sold to an E type owner, but the car retains the UK market SU carburetors and manifold setup, European curve distributor, European big bore exhaust and manifolds, and most importantly, a factory 4 synchro four speed manual gearbox with electric over drive. It also features a 3.31 Power-Loc differential as well as a completely rebuilt rear suspension and brakes (a hassle to do.) The 6-cylinder engine now in Jagusa is a healthy example with less than 90,000 miles and I can find a big valve head for it pretty easily. What is most relevant here is that this new development puts me very far ahead towards a running classic suitable for events and does away with my concerns with the car as delivered from Coventry. It isn’t quite a V8, but at least it is a step in the right direction, that being a manual transmission car with sporting intentions. I have seen these cars in England with this exact setup and it definitely appeals. It is a chance to experience Jagusa the way it should have been built in the first place, and then some, since the addition of a big valve head and F.I. cams will put the engine at roughly 245 horsepower with the previously mentioned carbs, distributor, and exhaust, rather than approximately 220. This compares to the paltry 157 horsepower the engine makes in Federalized trim. The windows go up and down, finally. I now know more than I ever wanted to know about Jaguar power windows. Who ever thought that Lucas could be involved with something approximating luxury and actually work reliably in the application? Yet it does, surprisingly well in fact. This has been my experience with this car and with Jaguar in general, pre-Ford ownership. Anyone who might question this is encouraged to look south to Italy to see how badly it can go wrong. Alfa Romeo and Lamborghini come to mind. One thing I would like to point out here is the importance of the use of proper lubricants for the specific application. Fully functioning doors and windows are a specific goal of mine in every car I build, own, or touch. In fact it is a pet peeve of mine when windows and locks fail to work, or worse, rattle away as you drive down the road. One culprit of this can compound the problem when it is not attended to properly. I refer to lubrication of the working components inside the doors and quarter panels. It is always a good idea to properly lubricate the inner workings of the doors every time a panel is removed. Over the course of time, things dry out and bind up. What can actually make it worse though, is to use the wrong type of lubricant. In this case, the wrong lubricant to use for inner door workings is molybdenum (moly) grease. The invention of moly grease has been a major step forward for critical assemblies such as wheel bearings and constant velocity joints found in most front wheel drive vehicles, and rear axle half shafts found in some Porsche and Ferrari model cars. The addition of molybdenum to a base lubricant allows the base to be of lower viscosity, among other things, which improves flow to critical areas (bearing raceways) that grease is designed to protect. The visual appearance of the final product looks ideal for every essential and non-essential subassembly since it is thinner than ordinary wheel bearing grease. Unfortunately this is not the case. In fact, using moly grease for other than its intended purpose can be detrimental to the assembly itself! The problem starts when the base grease stock dries out, which it inevitably does over time, usually sooner than other more appropriate lubricants. When this happens, molybdenum starts acting as an ABRASIVE, grinding out gears and sliding components, shortening their lifespan and creating opportunities for moving components to bind up when under load. Unfortunately Jagusa had been subjected to this from a well-meaning mechanic no doubt. What I found was window mechanisms stuck in the upright position, and reluctant to move, overpowering the motors and actually flexing the inner structures the motors are mounted to when attempting to operate. This called for the complete removal of all grease and the reapplication of #2 grease without moly. The proper grease for this application should be yellow in color. Moly makes grease black in color. Avoid moly grease for anything other than its intended application, which are wheel bearings and CV joints. Moreover, while it might seem tempting to use white lithium grease for doors and windows avoid it as well because it is too thin and evaporates quickly in an enclosed environment subjected to heat. After cleaning and reapplication of the proper lubricant, Jagusa’s windows are ready for the foreseeable future. 1) The schematic is wrong. 2) The schematic is confusing. 3) The schematic cannot be trusted, because it is wrong and confusing. 4) The window lifts are wired in series. 5) There are two power wires going to each motor that act as either power or ground depending on the direction of the window, up or down. 6) For each switch, there are two power leads acting either as power or ground depending on direction, and a jumper for each circuit providing power to the next switch in series. 7) Placement of the wires on the switch is critical for that window, as well as the next switch in series. 8) If you get it wrong, don’t worry. A thermal circuit protector protects the entire circuit so no fuses are required. Next step is transferring the power antenna from the parts car and tidying up the luggage compartment. Then its on to the euro bumper swapout! The bumpers have been swapped, the interior is in place (but has to come back out for climate control repairs), and a later 4.2 big valve engine and transmission has been sourced.